-Max Current Permissible 5 Amps. -Aluminum Die Cast, Powder Coated For Superior Corrosion Resistance. -Serrated Cams Locked Together Ensures Adjustment Settings Secure against any Vibration. 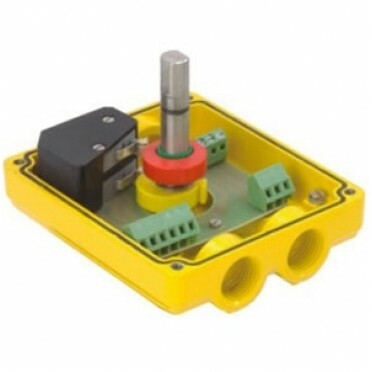 -Special PCB Eliminates All Wiring Form The Switch Element To The Terminals. -Three Cable Entries Provided As Standards. -Cable entries Provided As Standard. -Cable Entries M20 X 1.5, (3/4)" Et,(1/2)" Npt. -Complies To Namur Mounting Standard. -Solenoid Termination Inside The Switch Box Possible. -Additional Mounting Holes Threaded As Per Unc Series. -Range Of Mounting Accessories Having Compatibility With Various Actuator Manufacturers Available. -Stainless Steel bracket Available As Option. -Customer Can Choose Any Other V3 Configuration Micro Switch. -Certified By Ul To Ul508, File No. E249752. -Temperature Range -20OC To +80OC. Features & Specification :-Aluminum Die cast, With powder Coating For Superior Corrosion Resista.. Features & Specifications :-Max Current Permissible 5 Amps.-Aluminum Die Cast, Powder Coated For.. Features & Specification :-Intrinsically safe.-Weather proof enclosure, IP67.-P&F flat type ..